I don’t remember eating dessert in Spain. It’s not that there aren’t any desserts, but usually, I was so full and it was so late at night, that if I had room left, I tended to ask for fruit, like oranges with cinnamon and honey. This tart fuses those flavors. Bright, citrussy, and not too sweet, it is the perfect finish to a sunny day. I’ve been craving paella lately, and it’s so much better when its shared alongside a good Spanish red and a lively conversation. Sounds like the recipe for a dinner party!!! If I’ve learned anything entertaining friends, it’s that not everyone shows up on time – maybe they get lost or maybe they’re just not obsessively punctual like yours truly. So, I fix an appetizer or two that we can munch on as the group comes together. The main course tends to be something that comes out of the oven after the last guest arrives or can stand the rest. Or, occasionally in the case when I haven’t had time to prep the ingredients in advance, isn’t even close to ready and becomes its own entertainment as guests stand around my open kitchen watching me finish cooking. Setas al Ajo (Garlic Mushrooms). Note to self: buy more GF bread next time!!! The sauce on these meatballs was so good, one friend kept going back and scooping out one meatball and two or three spoonfuls of the sauce, which he would them mop up every last drop of with the GF bread I had toasted. Another piled mushrooms on pieces of toast like bruschetta, so that the garlicky sherry sauce would soak in. 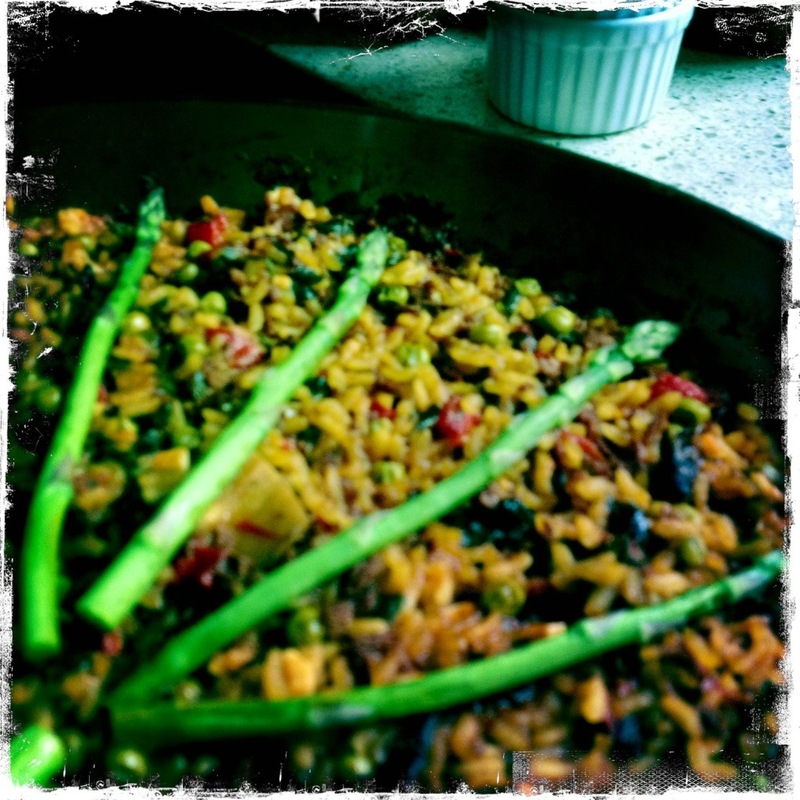 One of my favorite things to make for a dinner party is paella. Traditional paella is gluten, dairy, and egg free, without having to be adapted. The leftovers taste phenomenal. Oh, and I also like the drama of unveiling the pan at the table, although I’ve only managed to keep my guests out of the kitchen while I was preparing it only once. Here’s a sangria to go with it, even though you’ll only find tourists drinking it with dinner in Spain. After a long day at work, I opened the cabinet looking for inspiration only to stare blankly at a bag of polenta – boring, bland polenta. Then, I caught sight of a forgotten container of smoked Spanish paprika, and my mind began to wander back to Spain and the plates of tapas shared alongside glasses of sherry. This dish borrows those flavors. Since this comes together in less than half an hour, it is the perfect supper escape after a marathon day at work. The flavors are so intoxicating and have such depth that I wouldn’t be afraid to entertain friends with it, pairing it with a light salad and maybe even sangria.